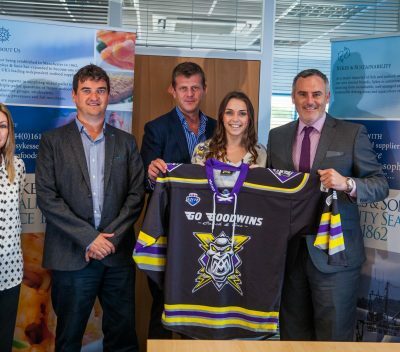 Here at Sykes, we are proud to announce our sponsorship of Manchester based Ice Hockey Team Manchester Storm for the 2016/17 season. The original Manchester Storm team were founded in 1995 in the new Manchester Arena. The Storm were a founding member of the Ice Hockey Superleague and went on to win the league championship in the 1998–99 season. Unfortunately, the original Storm were forced to close in 2002 but was finally reopened under the new General Manager Neil Russell in 2015. Neil Russell (General Manager) is thrilled to have Sykes sponsor The Storm: “I am simply delighted to have J.Sykes & Sons on board as a sponsor for next season. It is an excellent sponsorship for the club, and one that I am sure will flourish. Sykes are a very professional & successful company, and to be aligned with them is great. All of us at the Storm thank everyone at Sykes for making this happen, and we look forward to working closely with them as the season gets underway!”. “We are really pleased to be sponsoring Manchester Storm throughout the 2016/17 season, Neil and the team do a great job there and I’m excited to see what happens over the next year on and off the ice with the Storm. It is going to be a really exciting partnership & one we are all massively looking forward to being a part of”. Storm are known for their large following of loyal supporters, all of whom watch games religiously, follow the team across the country to support them and continuously devote themselves even during the off season. For Sykes, sponsoring a team which is so similarly run to ourselves on family values was an easy decision. For more information on Manchester Storm visit their website HERE or their twitter page HERE. Manchester Storm’s first match sets off the season on the 3rd September.